If you need an effective self-defense round for your 40 S&W, then don't look any further! 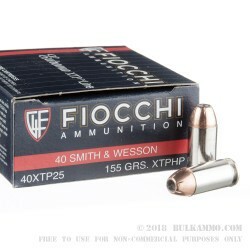 This Fiocchi self-defense ammo features Hornady's 155 grain XTP jacketed hollow point bullet, loaded and packaged by Fiocchi. This is great news for you; you get one of the best JHP bullets on the market, but won't pay as much for it. Hornady's XTP is widely regarded as an excellent bullet. It has predictable expansion, even after going through intermediate barriers, and it is consistently accurate. These are two things you really need out of a self-defense round. 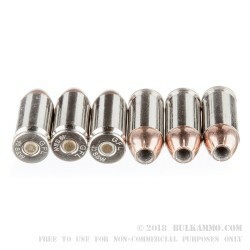 Each round is also brass cased, boxer primed, non-corrosive, and reloadable. 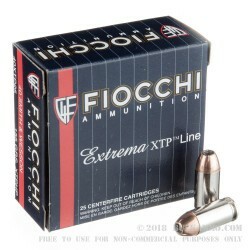 Fiocchi is an Italian ammunition manufacturer, which has been in business since 1876. They produce all of the most popular calibers, and have their own economical product lines as well as premium product lines. Why wait? 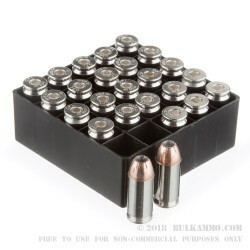 Order your supply of this great JHP ammo today!